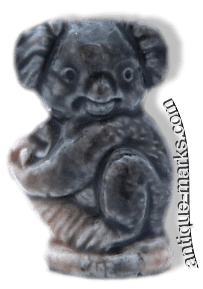 Wade is historically famous for the introduction of the very collectible Wade Whimsies and the, almost as well known but not as popular today, Wade Gurgle Jugs and Decanters. 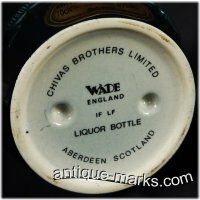 Originally founded in 1810, today Wade Pottery produces branded decanters for Scots Whisky makers including Bells, Chivas Regal’s Royal Salute, Grouse, Glenfiddich and Glenlivet. George WADE (1864-1938), was born in Tunstall, Stoke-on-Trent. His father was a potters thrower and later became a manager. 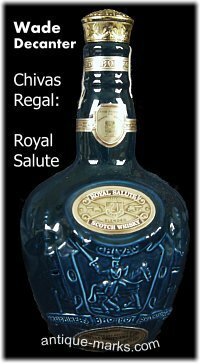 George himself was educated at Nottingham University and eventually became Chairman of George Wade & Son Ltd. The original Wade company manufactured ceramic products for the cotton industry as well as porcelain figures and groups. In 1905 George Wade purchased the ceramics business of Henry Hallen of Wellington Street, Burslem and combined both businesses to form a new ceramics manufactory he called the Manchester Pottery. George Albert Wade was born on July 19th 1891 to George Snr and his wife Marie Hart Wade. Young George was only 2 years old when his older sister Daisy, died in 1893 leaving George an only child. The Wade family eventually moved to Watlands Hall in Porthill, Burslem and George attended Wolstanton Board School and later the Newcastle-under-Lyme High School. In 1905, George Albert Wade left school and joined the Wade family business just as his father acquired the Hallen business and the Manchester Pottery began operations. George Wade & Son Ltd was based in the Manchester Pottery, manufacturing gas and electrical components and other industrial ceramics. Wade Heath mark on Flaxman pottery c1939. 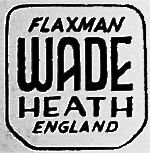 Wade Heath Flaxman Mark c1939. Flaxman can be missing. Wade Irish Porcelain mark circa Oct 1953. Can be impressed or printed. 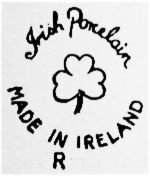 Made in Ireland added from April 1954. Potters monogram in centre. In 1927 George Snr retired. 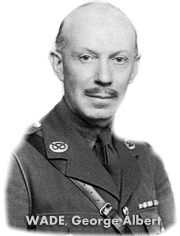 He died on New Years Day 1938 leaving the business to his son, George Albert Wade who was now Major Wade. Major Wade hired Jessie Hallen to work for him at the Manchester Pottery initially modelling garden gnomes for Carters seeds then porcelain flowers, animals and lady figures. In 1930 Jessie Hallen was given her own department at Wades Manchester Pottery. She produced superb porcelain floral arrangements and lady figurines. 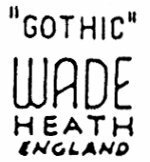 In 1931, Major George Albert Wade, became a director of both Wade Heath and A.J. Wade Ltd. In 1933 Major Wade became Chairman of both companies despite being a relatively minor shareholder. Jessie Hallen possessed superb modelling skills and George developed a flair for marketing. Together they made a formidable pair. Wade secured the Disney licence for Snow White and the Seven Dwarfs, which were modelled by Jessie Hallen. Eventually Jessie Hallen had her own studios in all three Wade factories. 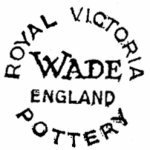 In late 1935, Wade Potteries Ltd was formed, merging both Wade Heath and AJ Wade Ltd.
George Wade was appointed Chairman and George Heath the Managing Director. Wade Heath had been producing beautiful ceramic art ware known as Flaxman Ware in the Art Deco style. 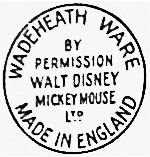 Wade Heath also produced a Mickey Mouse figure and a toy Mickey Mouse tea set, which were both released in 1935. In June 1937, George Heath died suddenly and Major George Wade assumed control of the Wade Potteries. When the Second World War began Jessie Hallen left Wade, never to return. Major George Wade was commissioned into the South Staffordshire Regiment. In 1940 Major Wade was promoted to Colonel and appointed to command the Birkenhead Garrison. In 1945, at the end of the war industrial ceramics were in great demand. 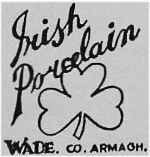 Wade was prospering and in 1946 the Wade company expanded; buying an old mill in Bann, Portadown, Northern Ireland and began producing electrical insulators. 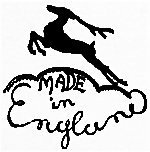 In 1950, the Irish factory proved itself as a successful venture and Wade (Ulster) Ltd was incorporated. Employing over 400 workers at its peak Wade (Ulster) eventually moved to producing porcelain giftware. Wade’s Irish factory was run by Major H. Straker Carryer. His wife Iris Carryer, Sir George Wade’s eldest daughter, was appointed Art Director. In 1952 Col. Wade bought Brand Hall near Norton-in-Hales, Stoke-on-Trent. It is better known to Wade porcelain collectors as Bloodshot Hall from the Whimsey-on-Why set. 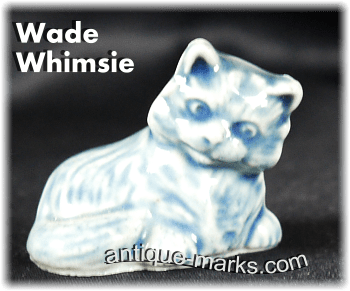 In 1954, Wade Whimsies were introduced and almost immediately became a popular success. Wade Whimsies were conceived by Iris and slotted into Wade’s production perfectly. The name Whimsies is reputed to have come about when the first figures were described as whimsical. 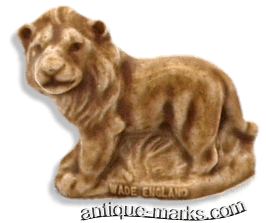 The first series of Wade Whimsies, released in 1954, were a set of animals that included a leaping fawn, a horse, a spaniel with a ball, a poodle and a squirrel. Lots more Whimsie collections followed, (the Red Rose Tea Whimsies for instance), and they became very collectable. They are still part of Wade’s production today. 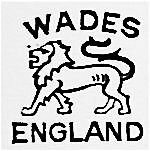 In 1958 Wade Potteries Ltd took over George Wade & Son Ltd and Wade (Ulster) Ltd, bringing all Wade companies together under Sir George Wade. In 1986, Col. Sir George Wade M.C. chairman of the Wade Pottery Group died aged 94.